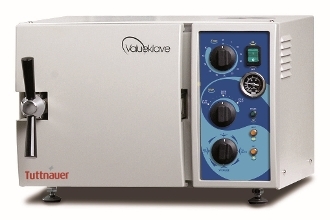 Designed for the cost conscience professional, the Valueklave 1730 will provide all basic sterilization needs at an economical price. The compact size makes it a perfect primary unit for small offices or a second autoclave for larger practices. The fast cycle time and heated drying delivers a quick turn around for wrapped or Unwrapped instruments. The simple controls and easy closing door make this unit a breeze to operate. All Valueklave's come with a 1year warranty on parts and labor. Features: - Fast Cycle Time. 9 minutes from a hot start (Standard Unwrapped Cycle time). - Automatic shut off at the end of both the sterilization and dry cycles. - A long life electro polished chamber and door. - Double safety locking device prevents door from opening while chamber is pressurized. - Overheat cutoff prevents burnout of heating elements in case of insufficient water in the chamber. - Drain valve is located on the front, allowing for quick and easy draining of water reservoir. - Dual safety thermostat protects against overheating. International certifications.